The daughter of a professional football player, Elana was born in Oceanside, California, but grew up in Douglasville, Georgia. A naturally gifted athlete across many sports, she was drawn to softball and by 9 years old she declared her intention to become an Olympian. She attended George Washington University on a softball scholarship and went on to play professionally for the Mid-Michigan Ice. After what she calls, ‘the worst tryout ever in the history of tryouts’ for the US Olympic Softball Team it appeared her Olympic dreams were over. It was actually her parents who saw bobsled on TV and suggested she give it a try. That turned out to be great advice. In the summer of 2007 she made the trip to Lake Placid, NY, home of the US National Bobsled Team. She never left. Elana turned out to be an incredibly powerful brakeman and less than three years later she stood on the podium in Vancouver as an Olympic Bronze Medalist. Post Vancouver, Elana decided to take the wheel, or in the case of bobsled, the ‘D-rings’, and transition to the role of driver. That too turned out to be a great decision. Not long thereafter she became a regular on medals’ podiums around the world, and eventually drove herself all the way back to the Olympic podium in 2014, this time in Sochi, Russia, and this time for silver. 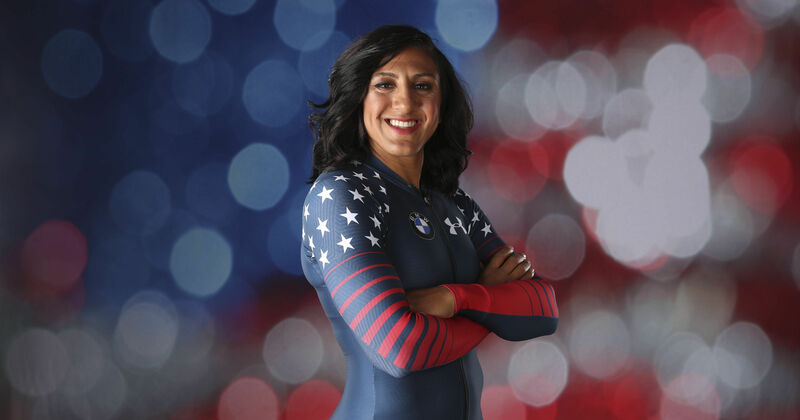 Later in 2014, she became Elana Meyers Taylor, marrying fellow bobsled athlete Nic Taylor in April of that year. Nic now competes on the US Skeleton Team. 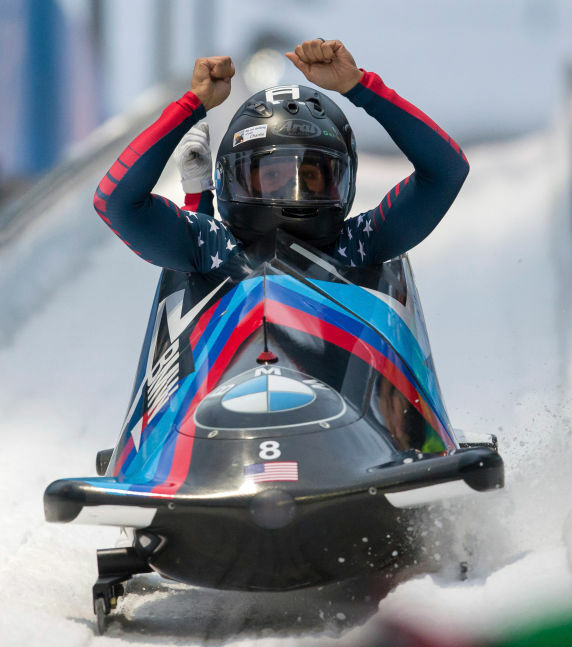 In 2015, Elana made history, becoming the first woman to earn a spot on the US National Team competing with the men, as a 4-man bobsled pilot (a feat that her husband helped her accomplish as the brakeman on her team). She went on to become the first woman to win a medal in international competition in a men’s event. That same year she won the 2015 World Championships in the 2-woman event, the first woman in US history to do so. That season she won 6 of 8 World Cup races and became the Overall World Cup Champion. Despite missing most of the 2015-16 season due to a concussion injury, Elana won the final two World Cup races of the season and a bronze medal at the 2016 World Championships. She also represented the U.S. in the first ever women’s 4-man World Championship exhibition race. In 2018, at the Olympic Games in PyeongChang, Elana battled back and forth with Team Germany over the four heat Olympic competition missing the gold medal by just .07. Elana intends to return to the Olympic Games in 2022 and once again fight for gold. Bobsled Pioneer: In 2015, Elana became the first woman to make the US National Team as a 4man bobsled pilot and the first woman to win a medal in international competition in the 4man event. 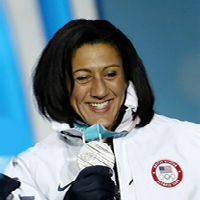 She is the only female US bobsled athlete to have won two Olympic medals. Elana is as accomplished in academics as she is in athletics. She has an MBA in finance, a master’s degree in sports management, and a bachelor’s degree in exercise science. In the summer of 2015, she worked in finance with the International Olympic Committee in Lausanne,Switzerland. A former professional softball player, her Olympic dreams were born on the diamond but realized on the ice. Her husband, former bobsledder Nic Taylor, proposed to her on the 2013 World Championships Podium at which she won silver, but from him got a diamond. Elana served a six year term as an Athlete Director on the USBSF Board of Directors and serves on the Women’s Sports Foundation Athlete Advisory Panel. She also serves as mentor for ClassroomChampions. An amazingly talented all-around athlete, in 2014 Elana earned a spot on Team USA Rugby 7s, and competed in two international caps before returning to her bobsled training.